"Many of the students in this group are in need of the most critical support to maintain their health and safety, including students with severe intellectual disabilities and serious health conditions," says the lawsuit, filed Monday in federal district court by a Colorado law firm. Lawyers are asking that the school district "immediately inform the parents of all disabled children how it will meet the special education needs of those children during the strike." Thousands of Denver teachers walked out Monday, after the teachers union and the school district couldn't agree on how much teachers would be paid. All Denver Public Schools were open except for pre-schools. "The district said they didn't have the staff with that higher level of training that's needed for young kids," Colorado Public Radio's Jenny Brundin told All Things Considered. And at one high school, chaos reigned, Brundin said. "One student posted a video of students leaving classes and flooding into the hallways where a spontaneous dance party broke out. Several students told me administrators tried to get students to go back to class, but when that failed, they said the kids could leave school, and several did. The district disputes that claim, though." DPS spokesman Will Jones told The Denver Post that students with disabilities were "well supported" in their schools Monday. 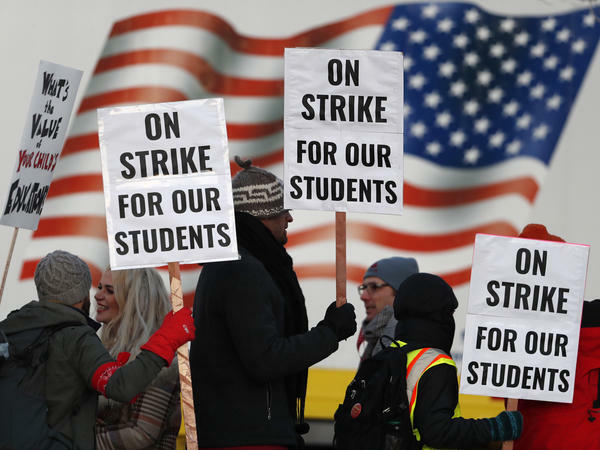 When the strike became a real possibility, school officials began recruiting substitutes with a special education background, he said, adding that the lawsuit appears to be "based on speculation" that students will be harmed. The school district readied 300 new substitute teachers to supplement its existing roster of 1,200, NPR has reported. But the lawsuit alleges it is "extremely unlikely" that DPS could find enough subs with the training or experience necessary to adequately care for students who are, in some cases, severely disabled. "The strike will cause severe emotional and psychological trauma for special education students, especially the large number of DPS students who suffer from autism," the lawsuit says. "With unexpected changes in routine, some autistic students may end up hurting themselves, hurting others and possibly suffering setbacks for months as a result of not receiving proper services." Merely hiring substitute teachers won't satisfy the school district's obligations under federal law to comply with individualized education plans, the lawsuit says. In addition to students with autism, the strike could negatively affect hearing-impaired students and students who are "emotionally disturbed," the suit says, alleging that "DPS has not publicly put any plan in place" to care for these students.